Walking through the streets in Brighton, you can find a muppet playing the piano in the North Laine, a hippy guy playing the saxophone in the Pavilion Gardens or a teenage girl doing some covers at Churchill Square. 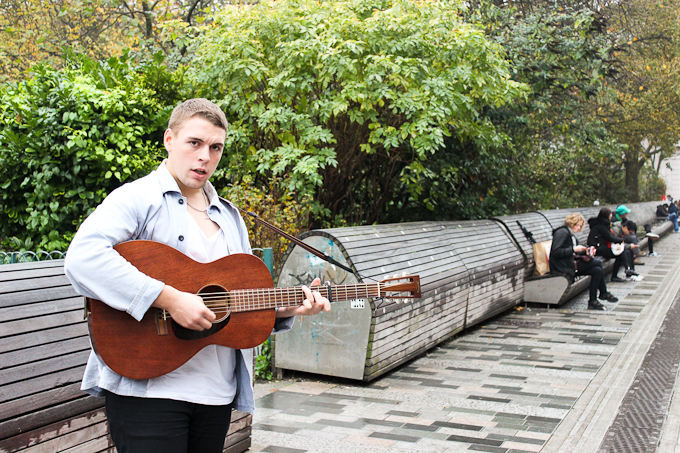 These are some of the buskers that fill the city with music. “Brighton is a cultural and lively place for music and arts”, explains Sam Jordan, 24, from Brighton, who has been playing as a busker for over 3 years. Jordan started to learn the guitar and write songs when he was 14 but it was a hobby. Ten years later, he is trying to make a living out of it. In a few months, he will release his first record. You can find him at the top of Duke Street, North Laine and Churchill Square during the week and at the weekends anywhere as it is busy in town. The council states that they are happy to have buskers because they liven up the streets. They issued a leaflet with do’s and don´ts. Some of the rules are no amplifiers, no drums, only one hour in one place, no selling CDs and only during the day, however, most of these rules are broken. “I disagree with them and I don’t follow them. I think common sense is the best thing. With time, you learn the places where people will not complain, such as outside the banks as the windows are soundproof”, says Jordan. He likes contradictions; he went from playing rugby to studying classical ballet and dance before he traded it all in for music. Any advice for musicians to be? “Being a musician and living from it is hard. You need to get used to climbing uphill the whole of your life, it doesn’t matter what you do. You need to try hard and make your own luck”, answers Jordan.